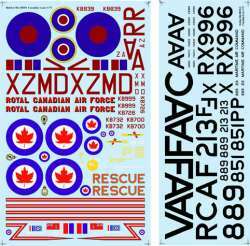 This sheet includes markings for five WWII Lancaster Mk.Xs, all from 419 Sqn as well as four post-war RCAF Lancaster 10s (2 maritime reconnaissance, 1 SAR and a Drone Carrier. Full markings including nose art and squadron badges, a very colourful set. Lancaster Mk.X (KB700) 419 Sqn. VR-Z "Ruhr Express"
Lancaster Mk.X (KB839) 419 Sqn. VR-D "Daisy"
Lancaster Mk.X (KB732) 419 Sqn. VR-X "X-Terminator"
Lancaster Mk.X (KB999) 419 Sqn. VR-M "Malton Mike"